There is no Cemetery Return (aka death certificate) for Ms. Moore. Either one never existed or it did not survive. Nevertheless, below is her obituary, published this date, February 11th, in 1864, identifying Bethel Burying Ground as her final resting place. Ms. Moore is one of the two individuals buried at Bethel Burying Ground that reached the age of 103. There are none older according to surviving records. In 1846 at 85 years old, she told a census worker that she was single and working as a washerwoman and was continuing to go to Bethel Church Sunday School to learn how to read the New Testament of the Bible. Additionally, she was described as being “lame” and living at 88 Gaskill Street where her living quarters consisted of a 9 ft. x 9ft. room. 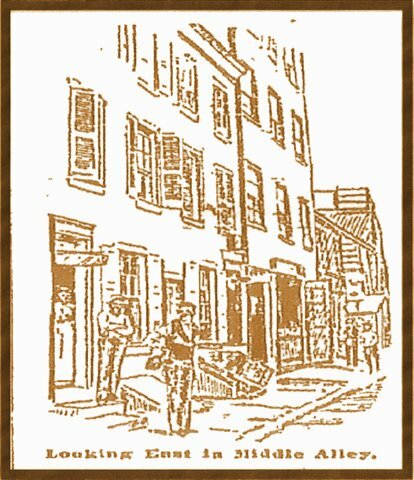 * In 1846-47, Ms. Moore was the next door neighbor of Ignatius Beck. See Mr. Beck’s biography on this website. 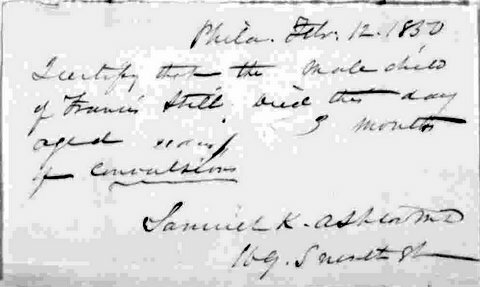 On this date, February 11th, in 1850 the six-month-old son of Josiah and Mary Purnell died of Pneumonia and was buried at Bethel Burying Ground. Josiah worked as a waiter and Mary worked performing “domestic duties,” according to the 1847 African American Census. It appears they were private servants to a wealthy family that lived on the south side of Washington Square. 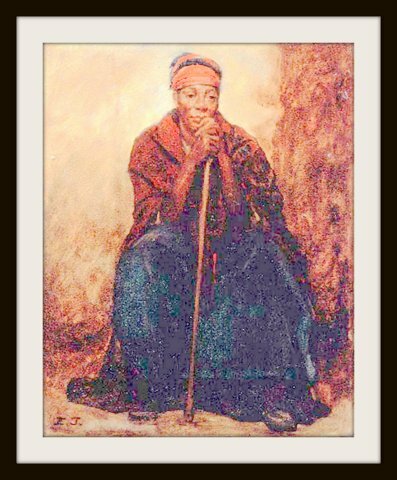 Josiah was born into slavery in Delaware and was freed through manumission. 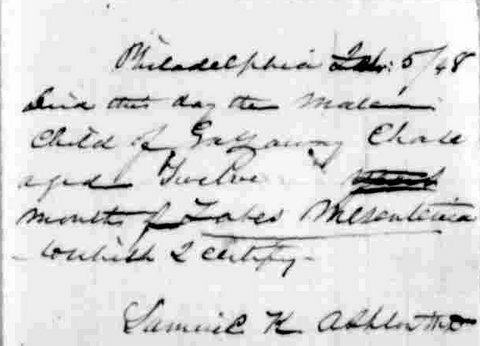 In the 1847 Census, Josiah, 29 years of age, is described as “Mulatto.” It also reports that Mary, 22 years of age, was born free. 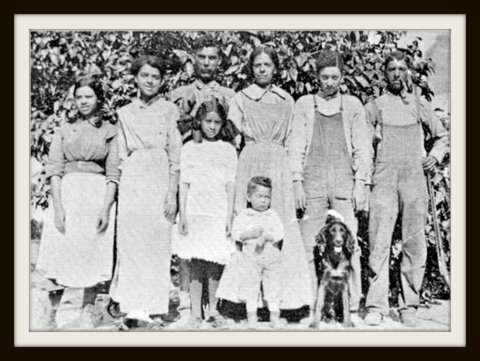 A Delaware family of Moors ancestry. Mr. Purnell’s family’s origins might have sprung from the family group known as the “Moors of Delaware.” The Moors are a tri-racial group of interrelated white, Native American and African families with origins on the Delmarva Peninsula of Delaware. Buried at Bethel Burying Ground are members of the Le Count family whose ancestry can be traced back to the early “Moors.”. See http://www.moors-delaware.com/gendat/moors.aspx. For additional reading on the “Moors of Delaware” see Delaware’s Forgotten Folk by C.A. Weslanger. 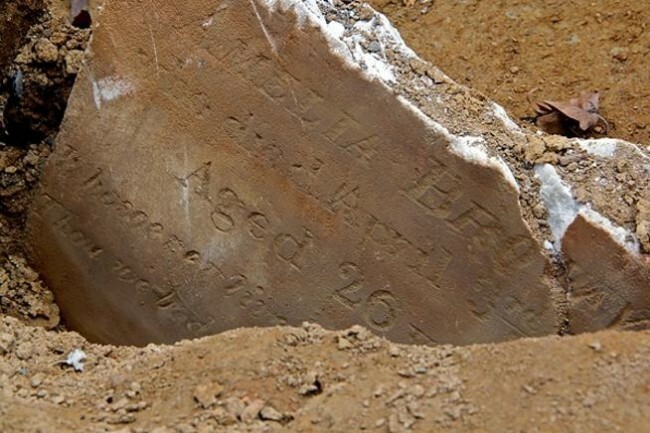 The four-year-old son of Caleb Hayes died this data, February 10th, in 1848 and was buried at Bethel Burying Ground. Ascites is not a cause of death. It is a symptom that describes a massive build-up of fluid in the abdomen. The causes for this symptom are many, including liver disease, cancer and bacterial infection. According to the 1847 African American Census, Caleb Hayes earned $12 a month as a waiter and his spouse took in laundry to add to the family’s income. They lived at 8 Washington Street (now 1108 Rodman Street) in the Cedar District of the city with four other children besides the unnamed deceased male child. There were five in the family that could read and two of them could also write. 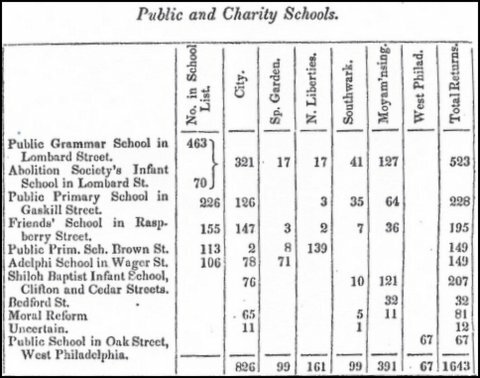 Two of the children attended school at 6th and Lombard Streets and one attended The Infant School in Lombard Street that was established in 1841 by the Pennsylvania Society for Promoting the Abolition of Slavery. It accepted children from 2-5 years of age and was staffed by two African American teachers. 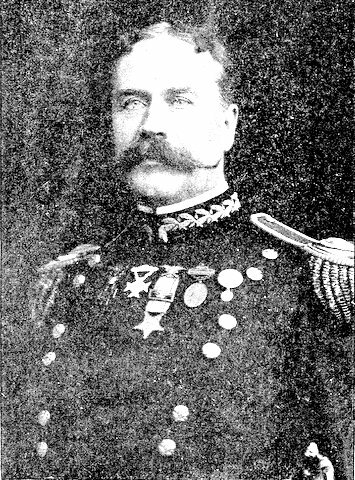 *http://www.navalhistory.org/2012/04/02/construction-of-first-naval-hospital; Jeffery M. Dorwart and Jean K. Wolf, The Philadelphia Navy Yard: An Illustrated History. 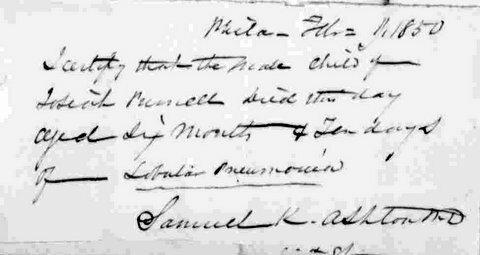 The one-year-old son of Sarah and Gazaway Chase* died on February 5, 1848 of Tabes Mesenterica and was buried at Bethel Burying Ground. The term “Tabes Mesenterica” was used up until the late 19th century to represent a group of illnesses in children that included malnutrition and swelling of the abdomen. Now that term is archaic and has been replaced by the term “tuberculosis of the mesenteric and retroperitoneal lymph nodes” or a type of cancer in the abdominal cavity. The Chase family lived at 801 S. 10 Street; the southeast corner of 10th and Catharine Streets in the Southwark section of the county. He was a porter in a store and later a barber. 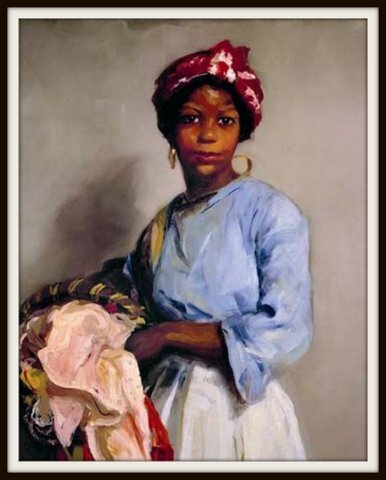 Sarah took in washing and ironing according to 1847 African American Census.